It's 11 pm on a Friday night. I'm listening to the soundtrack CD of Kinji Fukasaku's Battles Without Honour and Humanity series on headphones. The CD was a gift from filmmaker Makoto Shinozaki, who I met at the Rotterdam Film Festival in Holland in 2000. It was the year the festival paid homage to Kinji Fukasaku with a large retrospective of his work, something Shinozaki and the many other Japanese filmmakers present that year were very excited about. It was the first retrospective of Fukasaku's films ever held, an honour even his homeland had never bestowed upon him. It would be the first retrospective of many and the start of Fukasaku's belated international breakthrough. Several months later Battle Royale was released onto the world and the rest is history. Unfortunately, Kinji Fukasaku himself is history too now. Several days ago I got a call from a friend who had just returned from Japan. Just before she boarded the plane at Narita, the news broke that the director had succumbed to the cancer that had started in his bone marrow some years ago, but which had by now spread through his body. The man who had survived many a battle in his nearly 73-year lifespan, from American bombing raids to parliamentary attempts to ban his work, had finally fought and lost his last. At a press conference at the end of 2002, Kinji Fukasaku announced that he would start production on Battle Royale 2, his 61st film. He also announced that he was suffering from cancer in an advanced stage, but that he would forego medical treatment in order to step behind the megaphone one more time. It was an awe-inspiring decision. Here was a 72-year-old man, Japan's most consistently successful film director, a man revered the world over, a man with nothing left to prove. But he showed a defiance, an energy and an abandon worthy of any of the raucous, untameable characters he portrayed in his films. Like Graveyard of Honour's Rikio Ishikawa, who fought the law and the underworld all at once while hardly able to stand on his legs and chewing on his dead wife's bones. Like Shozo Hirono in Battles Without Honour and Humanity, who stuck to his beliefs while his world crumbled around him and those he trusted betrayed and used him. But just like his characters, death did finally and inevitably catch up with Kinji Fukasaku. His passing followed very closely on the deaths of two of his close friends and collaborators. In November 2002 screenwriter Kazuo Kasahara, who scripted the first four episodes in the Battles series as well as Cops vs. Thugs, Yakuza Graveyard and many others, shed his mortal coil. He was followed one month later by director Koreyoshi Kurahara, Fukasaku's study mate (and co-founder of a film club) at Nihon University in the late forties and later his co-director on 1981's The Gate of Youth. It's tempting to think of the consecutive deaths of these three men as marking the end of an era. Perhaps it does, in which case the recent remake of Graveyard of Honour already signalled the changing of the guard. However, Fukasaku himself was not one to step aside and let brash young hopefuls take over his turf. His 1992 action spectacular The Triple Cross was testament to this: a challenge to the emerging generation, a way to put those who aspired to the throne in their place. When many of those same young hopefuls accompanied Fukasaku in Rotterdam in 2000, they were indeed in their places: among the audience, watching the master's films. Kiyoshi Kurosawa hurried to make it to the screening of a restored print of the previously lost If You Were Young: Rage. Takashi Miike smiled through the entire 82 minutes of Greed in Broad Daylight. Makoto Shinozaki recounted how touched he had been by a scene in Under the Flag of the Rising Sun. They were a lot more reverent of him than Fukasaku himself had been of the generation before him during his own youth - as he himself admitted during a symposium when he let slip that he at one time "wanted to kill Akira Kurosawa." The confession was accompanied by a mischievous grin. The fact that I've mentioned the 2000 edition of the Rotterdam Film Festival twice already is neither coincidence nor due to sloppy writing. 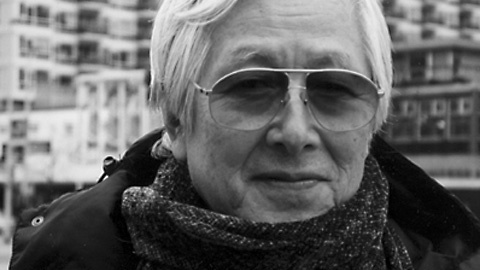 The idea for what would become Midnight Eye was born at this festival, and Kinji Fukasaku and his work have been a mainstay of the site since its inception. The first time we ever did a special edition devoted to a single filmmaker, Fukasaku was the focus. Since then we've been steadily reviewing the many facets of his career, from the quintessential gangster films, to the (in Jasper's words) 'camper than a row of tents' Black Lizard, the 1980 megabuck SF epic Virus and of course the unforgettable Battle Royale. We finally got our chance to interview the great man in 2001 (in Rotterdam again) for an all too brief 30 minutes. It was the only time I've ever been nervous all through an interview. Unfortunately, those thirty minutes will never grow into an hour. Kinji Fukasaku is gone. Another soul put to rest at the graveyard of honour. May he rest in peace and may his films continue to delight, enthral, amaze, stun and shock viewers for generations to come.